Build the Tech, Stop the Carnage, Save the World! Freelancer.com kicks off the largest inter-collegiate hackathin for disaster response management dubbed as Hackzilla in Manila. 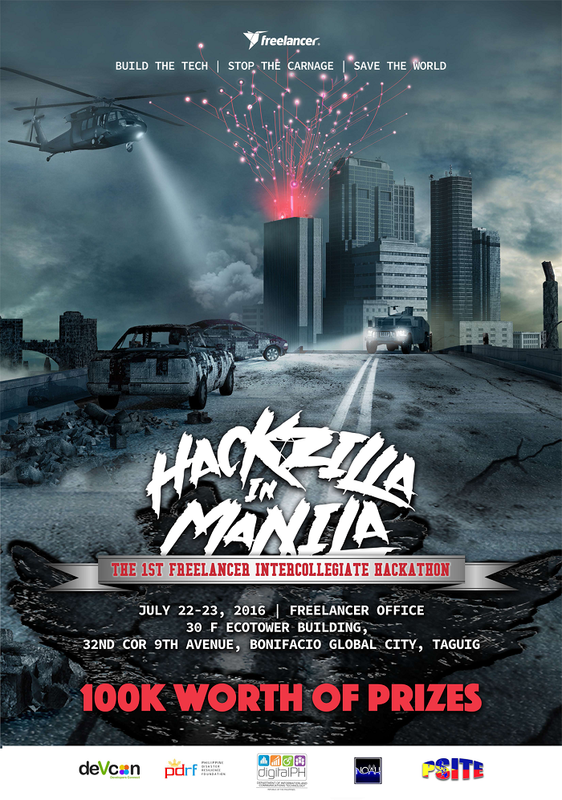 The first-ever Hackzilla in Manila is Freelancer.com’s inter-collegiate hackathon. Within 36 hours, students will be challenged to build mobile applications, websites, and various other technological solutions that will concentrate on alleviating the harmful impact of natural calamities. This year’s theme is Preparing the Philippines to effectively respond to natural disasters through the use of technology. In partnership with the Philippine Disaster Response Foundation (PDRF), The Department of Science and Technology’s (DOST) Project NOAH, the Department of Information and Communications Technology (DICT), Developers Connect Philippines (DevCon), and the Philippine Society of IT Educators (PSITE), Freelancer.com’s event Hackzilla in Manila will happen from July 22 to 23, 2016 at the Freelancer.com office, 30th floor, Ecotower, 32nd cor 9th Avenue, Bonifacio Global City, Taguig. On June 22, 2016, the whole of Metro Manila joined together in #MMShakeDrill--a massive earthquake drill aimed to prepare citizens for a 7.2-magnitude earthquake caused by the movement of the West Valley Fault. Organized by the Metro Manila Disaster Risk Reduction and Management Council (MMDRRMC) together with the Metro Manila Development Authority (MMDA), the Office of Civil Defense (OCD), and various other stakeholders, the metrowide event aims to mitigate the widespread loss of lives and properties. Such preparation is not unfounded paranoia: more than ever, it is a necessity. With the Philippines having been hailed as one of the world’s most disaster-prone countries, the country must acknowledge the inevitable onslaught of supertyphoons and earthquakes (much like it had during Typhoons Yolanda and Ondoy) in the years to come. Being caught off-guard without proper disaster response strategies is the worst thing that could happen. As a firm believer in the capability of technology to empower Filipino talent and catalyze positive change in communities, the world’s top online freelancing website Freelancer.com has spearheaded an innovative hackathon that will rally college students to pitch their transformative ideas to address societal problems. With Preparing the Philippines to effectively respond to natural disasters through the use of technology as the theme of the first-ever Hackzilla in Manila, Freelancer.com’s inter-collegiate hackathon, students will be challenged to build mobile applications, websites, and various other technological solutions that will concentrate on alleviating the harmful impact of natural calamities. In partnership with the Philippine Disaster Response Foundation (PDRF), The Department of Science and Technology’s Project NOAH, the Department of Information and Communications Technology (DICT), Developers Connect Philippines (DevCon), and the Philippine Society of IT Educators (PSITE), Freelancer.com’s event Hackzilla in Manila will happen from July 22 to 23, 2016. ○ A short 2-minute video, uploaded on YouTube, outlining their hackathon pitch in line with the event theme. 5. Deadline for submission of entries will be on July 8, 2016. 6. Selected and alternate teams will be notified via email on July 15, 2016. 7. Competing teams should be present on July 22 at the Freelancer.com office, 30th floor, Ecotower, 32nd cor 9th Avenue, Bonifacio Global City, Taguig. The winning team will be announced on July 23, with the finalists’ entries judged by representatives from Freelancer.com and its partner organizations. ASEAN @ 50 - Is Integration Doable? ASEAN Integration – A Realization or a Delusion?